The base game was pretty good. It had some long-term problems with the campaign and certain mission types could be a slog, but the combat portion of the game was in general an admirably well-pitched game of positioning and ship micromanagement. It actually understands its source material. The second point shouldn’t be understated: Battlefleet Gothic, almost alone amongst 40k videogame adaptations, actually felt like it. The sweeping scope of the game really helps, since instead of single planets you’re dealing with entire sectors, and instead of generic Space Marines you’re commanding kilometres-long battleships with tens of thousands of crew. When you screw up, planets die, and that’s very 40k; there’s few other games that have really captured the overblown nature of the universe like Battlefleet Gothic did. Combined with a refreshingly novel theme — there aren’t all that many naval combat games with the relative accessibility of Battlefleet Gothic — and an adequately engaging game system, it was more than enough to make me feel very well disposed towards the idea of a sequel, even if I never actually finished the original game’s campaign. BFG 2 certainly makes a bombastic first impression that fully leverages recent events in the 40k setting. After thirty years of the fluff going on and on about what might happen if Cadia fell and the forces of Chaos could escape the Eye of Terror (but nothing ever really happened that might upset the status quo) Games Workshop did something unprecedented: they actually moved the story forward by a thousand years or so. It’s now the 42nd millennium, and all of those imminent existential threats the Imperium was supposedly facing in the 41st millennium — but whose actual long-term impact was limited to the galactic equivalent of a sad trombone noise because the setting was permanently stuck in amber — are suddenly and scarily real. Cadia has fallen; in fact it falls in BFG 2’s tutorial after the Chaos big bad and (up until this point) chronic serial failure Abaddon the Despoiler finally succeeds in crashing a gigantic space station into it, shattering the planet in an awesome series of cutscenes. With Cadia’s destruction the Eye of Terror has expanded to split the galaxy in half and the forces of Chaos are now boiling out of the old Eye intent on blowing up everything they see. The only thing now holding them back are the cannon-festooned flying cathedrals of the Imperial Navy, along with their allies in the Space Marines and the Adeptus Mechanicus. This is the first big change from the first game: instead of the Space Marines and Mechanicus being upgrades for your existing Imperial Navy ships that would make them better at boarding (or whatever), they’ve been given their own fleet types in BFG 21. Where the Navy has access to a wide range of ships that can be used to construct flexible, well-rounded fleets, both of the new factions excel in one area but have a reduced fleet roster to reflect this extreme specialisation. The Mechanicus ships have lots of long-range plasma cannon and every single one of their ships mounts a Nova Cannon artillery piece for nuking multiple enemy vessels at once, but they’re quite slow and weak up close. The Space Marines are the opposite: they have fast ships with reduced health and few guns compared to a Navy ship, but they do absolutely staggering amounts of damage in boarding actions and have access to boarding torpedoes and special teleport attacks to deliver fanatical super-soldiers straight into the heart of the enemy fleet. Playing with three fleet types instead of one gives BFG 2 some sorely-needed variety compared to the original; like BFG 1, the sequel asks you to fight hundreds of battles over the course of a campaign, and it’s a great help that you’re not fighting with the same ships every time. That applies to the opposition, too, as the range of enemy factions you face has been expanded from the original Chaos, Ork and Eldar fleets to also include Necrons, Dark Eldar and Tyranids. Dark Eldar are effectively an Eldar palette swap with better boarders and so aren’t anything to write home about, but the Necrons and Tyranids are more interesting. The Necrons field tough, expensive ships with powerful area-of-effect attacks and an energy wave ability that can delete incoming ordnance; when fighting Necrons it’s a good idea to treat each ship as if it were one size class bigger than it actually is, because it will definitely feel like it. The Tyranids on the other hand behave like Orks on steroids: they eschew ranged weaponry almost entirely in favour of ramming attacks and the most sickeningly powerful boarding actions in the game, and unlike the Orks it’s very difficult to evade them because they have grappling tentacles and a speed boost that puts every other faction in the game to shame. 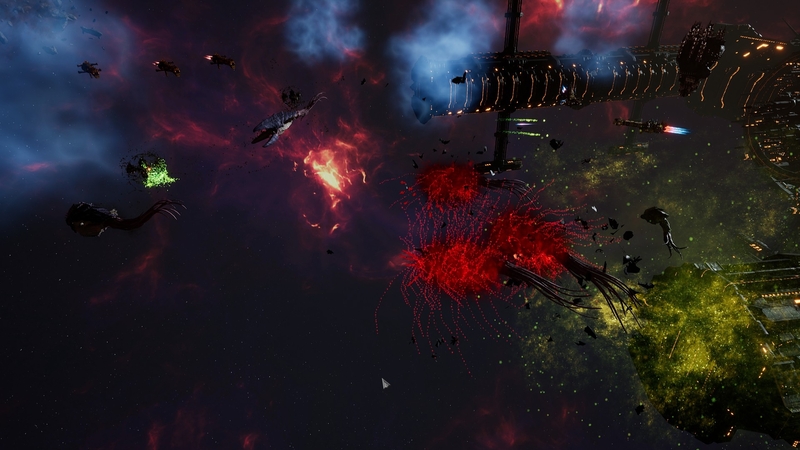 Fighting Tyranids feels like the battle of attrition that it should be against a foe that has zero regard for its own ships’ survival; you know you’re going to take a lot of damage and that you’re probably going to end up losing a cruiser or two, and it’s all about doing what you can to minimise those losses. Although the combat layer is largely untouched from BFG 1 there have still been some moderately impactful changes to the way it plays. First, most of the mission types have been ripped out of the game — no more tedious Planetary Bombardment missions or playing kiss chase with Chaos cruisers on a Data Recovery mission — in favour of just two: point control, or a straight up battle of annihilation. This is a big improvement, oddly enough, as most of the mission types in BFG 1 introduced mechanics that were not about ships fighting each other into a game where I’d like to spend my time making ships fight each other. Second is that most ship abilities that fire ordnance (fighters, torpedoes, boarding pods) now have a limited number of uses per battle, which reduces the amount of nova cannon spam and forces ships to rely on their full range of abilities and armament. And third is that all ships now have a Crew value as well as an HP bar; boarding actions and certain weapon attacks deplete the crew value, gradually reducing the ship’s efficiency until it hits zero, at which point the ship becomes an empty drifting hulk that plays no further part in the battle unless you recrew it with a boarding action of your own. The last change is what makes the Tyranids (and to a lesser extent the Orks and Space Marines) so scary. They don’t have many guns, but then they don’t need them when a single set of boarding pods from a Tyranid battleship will completely decrew a light cruiser and cripple anything else that’s not another battleship. 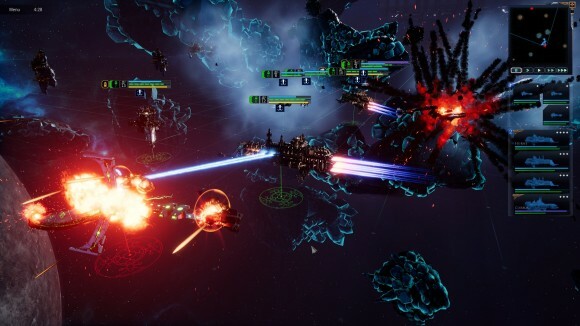 My first criticism of BFG 2, though, is that while I think the total amount of crew damage each ship does per boarding action is more or less correct, having it be applied immediately makes it possible to instantly kill otherwise-untouched enemy battlecruisers by firing off a bunch of Space Marine boarding abilities all at once. Boarding actions are limited-use which prevents this tactic from being totally overpowered, but it does short-circuit large portions of the game (i.e. the parts where ships shoot actual guns at each other); it would be better if the crew damage were applied over time and other ships could teleport over reinforcements to a ship that was fighting off a boarding action. As it is the ships that can do ramming, high-damage boarding actions and also fire off assault boats from their carrier decks — the Space Marines and the Imperial Navy — feel far more powerful than the Mechanicus, who have one opportunity at the start of a battle to alpha strike the grouped-up enemy forces with a mass nova cannon bombardment, and then it descends into a melee and you’re not going to get anywhere near as much out of it. The campaign layer is where the real difference from BFG 1 lies, however, as the old BFG campaign structure has been tossed out the window entirely and replaced with something far more emergent. You start with three small fleets and a single system in the Cadian sector, which has been overrun by Chaos. There are 12-odd systems in Cadia connected by the usual linear warp paths you can find in just about any space-based 4X. You have complete vision of the entire sector, and so you plan your attack: each system can only contain three fleets on each side, all of which will join in any battle that takes place there (with additional ships replacing destroyed/withdrawn ones as reinforcements), so you avoid the systems with three Chaos fleets and focus on those which are only garrisoned by one. The first system you capture has a shipyard, which allows you to spend resources to buy frigates and light cruisers to bolster your tiny fleets. Ships are built instantly in BFG 2 and you can buy unlimited numbers of any ship from the classes you’ve unlocked (linked to your admiral’s level), with the only restrictions being upkeep costs, the total amount of ship value you’re allowed to have in a single fleet (again, linked to your admiral’s level), and the shipyard’s construction capacity, which regenerates every turn. The next stop is the Cadian system itself, which has a forge world and a bigger shipyard and lets you build up your fleets even more so that you can clear out the rest of the sector. At which point another sector unlocks and you get to do it all again, except against a different flavour of opposition with bigger ships and more story missions. So far, so 4X. However, something you might notice on your rampage through Cadia is that the AI fleets are almost totally supine; they don’t attack you and barely try to develop their holdings, and for once this is entirely intentional because of the way the opposing AI factions in BFG 2 have been put together. By far the most interesting thing about the campaign mechanics (to me, anyway) is that they’re deliberately asymmetric; the AI doesn’t have a storyline to work through and is solely there to provide a credible, threatening opposition force instead of attempting to win the campaign, so it’s not even trying to play the same game as you. 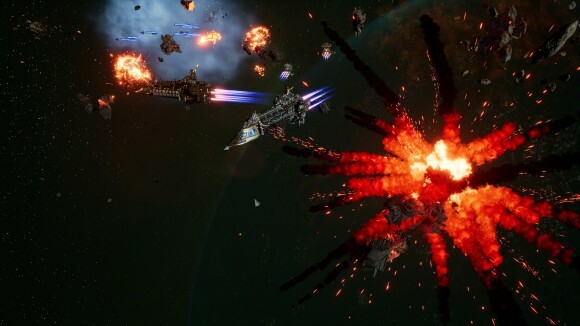 It doesn’t have to gather resources, it doesn’t have to upgrade planets, and it certainly doesn’t have to use shipyards to build ships — it’ll magic them out of thin air when it does, just like a bad Total War AI. However, this is all explained up front to the player and linked to a single, highly visible Threat level for each faction within a sector. The higher a faction’s Threat, the more latitude it will have to build new fleets, fortify its positions, and launch attacks on other systems. A faction with a Threat level of zero basically won’t do anything, which is why the Chaos fleets at Cadia are so curiously inert — it’s the system for the campaign tutorial and they hold almost all of it to start, and it wouldn’t do to have them instantly shred the player’s tiny fleets with their massively overwhelming force. A faction with a Threat level of five, on the other hand, should be stomped on before it builds up too much; a threat level that high will give it a whole bunch of free actions to mess with your plans. A large part of the campaign is therefore about managing Threat. There’s a whole host of factors that go into it: a world inside a system might have a Necron tomb on it, passively boosting the Necron Threat in that sector unless you permanently station a fleet there. On the other hand, upgrading a planet with an Inquisitorial fortress on it will reduce the Chaos Threat level in that sector. Locking down progressively larger amounts of territory inside a sector will apply a blanket reduction in Threat across all factions. In general, once you launch into a sector you want to take the entire thing as quickly as possible to avoid getting bogged down, which leads to some interesting decisions where you balance pushing every fleet almost to the point of destruction to keep the blitzkrieg going with the need to periodically pull back to a shipyard (often in an adjacent sector) to repair and recrew your ships, since damage to both ship health and ship crew count is persistent and won’t recover all that quickly otherwise. There’s another Threat-related reason to move quickly, though: in the bottom right of the campaign screen is an XCOM 2-style Doomsday meter. It’s nothing fancy, simply incrementing by one every turn, but every 7 turns the global Threat level across all of your sectors will increase by one. If you somehow let it increase for 28 turns on the trot you lose the game outright — this is an absurdly generous time limit and is simply there to stop you from turtling too much, but the intermittent Threat increases are fairly dangerous since they can trigger invasions and attacks in otherwise pacified sectors, forcing you to tie down valuable fleets with defence missions. There are two ways to reduce the Doomsday meter. 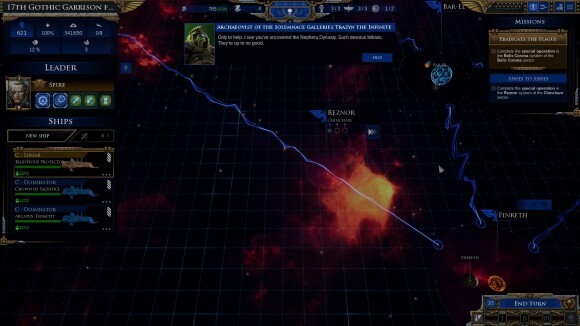 One is to spend the Battleplans resource to decrement the meter by one, but Battleplans are valuable and quite hard to come by and buying yourself a single turn isn’t all that useful unless a single turn is all you need to sequence your fleet movements correctly. The second method, and the one you’re supposed to do, is to complete scripted Special Operation missions that advance the campaign storylines. There are multiple strands of storyline, some of which can end with the elimination of one of the enemy factions from the game, but all of the Special Operations are very tricky in comparison to the standard sector conquest battles and you’ll come out of the other side with, at best, a very battered fleet. However, in addition to being very cool story beats (Tindalos are really leveraging the newly-apocalyptic setting to create some awesomely overblown moments) and rewarding you with a decent chunk of admiral XP, completing any Special Operation resets the Doomsday clock to zero. The catch is that most of the Special Operations you’re given lie in newly revealed, yet-to-be-conquered sectors, so you’ll have to get move on in order to smash your way through to the operation system before the Doomsday clock ticks up too much. Because the AI’s playing by a different set of rules its attacks and defences work very differently to yours. 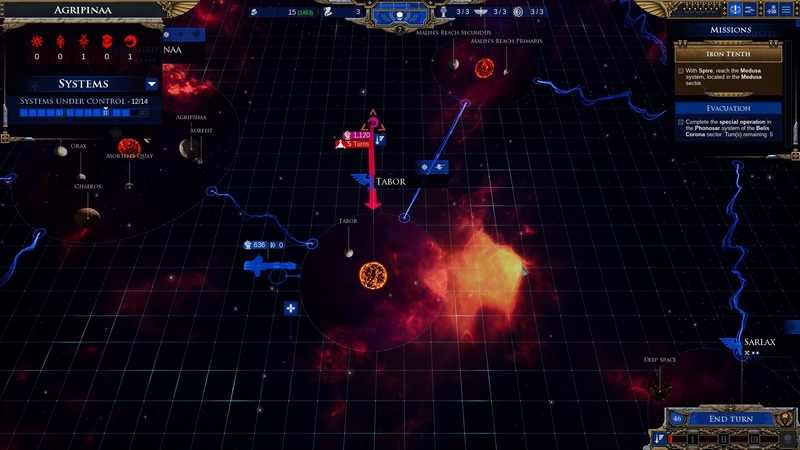 For example, when you attack a system it’s a matter of simply moving your fleets in and clicking the “Launch Battle” button, but when the AI factions launch an assault some big arrows appear indicating which fleets are attacking and which system is under attack, along with a timer telling you how long you have before the assault is launched. Most intra-system assaults give you just a single turn to prepare, but you can delay it by an additional turn by building a Minefield in that system, and spend Battleplans to delay it even further, giving you time to shuttle in defensive fleets. 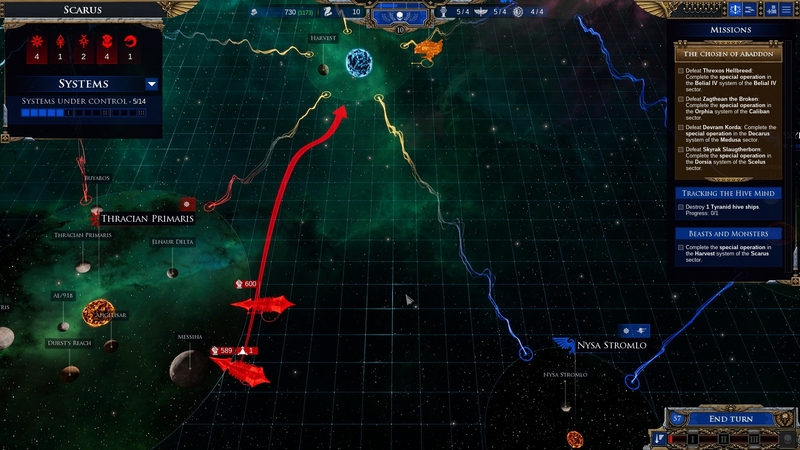 The AI can also launch invasions of already-pacified sectors; these aren’t launched from any specific location and can come out of nowhere as long as there’s enough Threat in the sector to generate one, but to compensate for this you’re given a full three turns to prepare — and again, this can be delayed further by Minefields and Battleplans. 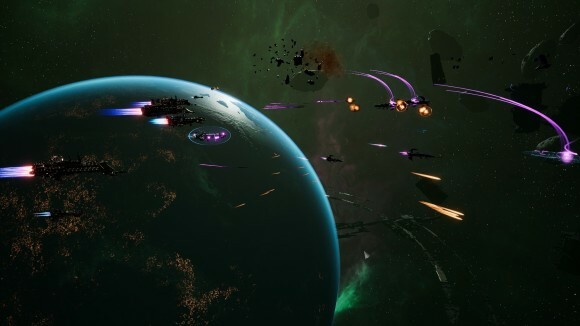 The AI can also build Minefields, but since your attacks don’t have a timer attached to them a Minefield in an AI-controlled system will instead lock off one of the three friendly fleet slots in that system, forcing you to attack with a reduced force. If it wasn’t already obvious, I really like this asymmetric, boardgame-like way of controlling AI behaviour. Coding a true strategy game AI is hard, as evidenced by market leaders such as Total War and Civilization repeatedly screwing it up, and while BFG 2 is by no means as complicated as either of those games it’s still tricky to make an AI that can play by the same rules as a human player while still providing a reasonable level of challenge. Tindalos’s solution here has been, very reasonably, to not bother trying, and instead to reframe the problem so that it’s far less complicated. They’ve deliberately created a game structure that allows them to abstract complex mechanics such as economy management and shipbuilding into a comparatively simple Threat counter system, and made their job much simpler while generating much the same outcome as if they’d coded a full AI. 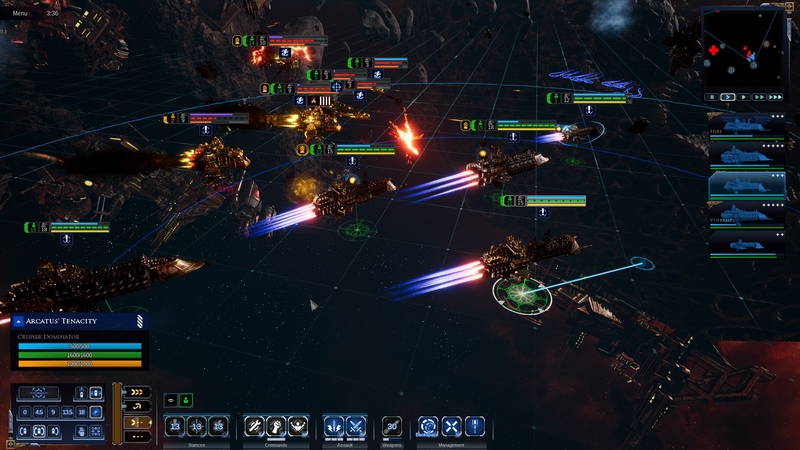 The AI in BFG 2 does everything required of it; it builds fleets, fortifies systems and launches attacks, and in general provides more than a mere speedbump to your progress through the campaign. It’s just using free actions to do it, and while this would be annoying if Tindalos were trying to pretend it was playing the game like a human would, they’re refreshingly up front about the fact that’s it not, and have actually woven that concept into the core of what drives the campaign forward. Still, while the AI’s asymmetric nature is a masterstroke it’s not a perfect campaign by any means. Having new sectors unlocked and new factions introduced and gradually gaining access to more ships and bigger fleets is very engaging, to be sure, and thanks to the division of your forces into multiple fleets (you can have up to 15) the composition of these multi-fleet task forces and the shuffling of fleets between attack and defence produces some meaty strategic decisions. However, it’s still a very long campaign (I’m currently 30 hours in and it feels like I’m barely halfway through) and that creates exactly the problems you’d expect. Your planet upgrades feel small, being on the scale of an additional 1% discount/boost to things, and when you’re dealing with one sector and twelve systems they certainly are small, but when you’re conquered six sectors and have well over a hundred planets under your control these upgrades all add up to the point where your break the economy; I generate 1500 resources per turn (for reference a battleship costs 500-ish) and am constantly floating at least 5000 because I’ve maxed out my fleet sizes and have run out of things to spend resources on. I am also starting to get tired of the fleet combat despite the greatly increased variety amongst both friendly and enemy forces; if anything BFG 2 asks you to fight even more battles than the first game did, and I challenge you to do anything a hundred times and have it not start to get a little bit passé. I’m genuinely a little worried that despite the really sterling work Tindalos have done with the campaign structure and story I might not make it to the end before getting distracted by the rest of the February/March glut of games. I think, then, that Battlefleet Gothic 2 is the archetypical sequel. The core game is improved but not drastically different, and the additions mostly come in the form of more stuff that expands the range of what you can do and encounter instead of fiddling with fundamental game mechanics. The campaign is the most revolutionary part, but while it’s a definite improvement on the first game it ends up falling into the same trap: there’s just too much of it. That Tindalos have included Tyranid and Necron campaigns as well is something I now find daunting instead of pleasing; I barely have the stamina to finish one campaign, let alone three. That criticism is personal preference on my part more than anything else; I’m sure there’s people out there who relish the idea of a beefy 4X-lite campaign that’ll likely take well over a month to play through, but I’m not one of them. Which is really quite a shame, because aside from the occasional piece of ropey voice acting it’s all carried off with a surprising amount of panache, to the point that if I wanted to introduce somebody to the setting I’d probably point them towards Battlefleet Gothic 2 as something that’s representative of the best the 40k universe has to offer. It feels like it has more flavour to it than any other 40k game I’ve played, in addition to being a good game on its own merits; Battlefleet Gothic 2 does most things right, and the things it does wrong are all forgivable. This meta-campaign layer sounds great. I haven’t played Company of Heroes Ardenne’s Assault but it sounds very similar. Ugh, that campaign length! The detail missing from all the reviews of this game that I wanted was whether the campaign had been dialed back a little, and it sounds like they doubled down on the slog. Still sounds like a worthy game to dabble in; I’ll probably wait for a sale. Sounds better and more polished than the first game, which means I shall probably pick it up. I can swear in one LP I saw there was also a Tau faction.